Behavioural Economics tells us that there are two distinct systems in the human brain. System 2 is the bit that controls language and reason, abstract problem solving and logic. It’s the teachable, learning part of our minds. System 1 is the seat of our instincts, our impulses, our emotions. System 1 is our inner monkey-lizard-worm brain, the product of hundreds of millions of years of evolution. And System One, it turns out, makes all the decisions for us. System 2 merely rationalises our choices after they are made. This has led to serious rethinking of government policy, economic theory and marketing. If our monkey brain is making all our purchasing decisions, it’s reasonable to ask what the point of arguing people into buying things? And if the most effective advertising appeals to a part of the brain that doesn’t even use language, is there any point in research that asks us direct questions about products or advertising? It’s easy to scoff at research. It’s easy to say that it’s a waste of money – but that’s not very helpful if you’re a marketer. Because sellers still gotta sell. And it’s good to have some evidence that the ten million pounds you’re about to invest in a campaign is going to work. Researchers have attempted to crack System One’s codes by attempting more lateral forms of question. Implicit Association Tests time a consumer’s response to different puzzles. By measuring whether the response is instinctive (system one) or has to be thought about (system two) researchers claim to be able to measure how deep a consumer’s feeling for a concept is. While IAT may be an interesting way to gauge somebody’s unconscious racism, it’s dubious whether it really tells us anything meaningful about their preference for Shell’s service stations over BP’s. So how do we get access to System One? Well, we have good news. The answer was actually cracked 38 000 years ago in a cave in Southwest Germany. 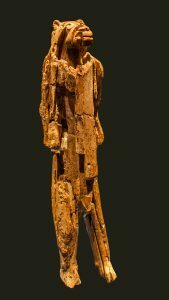 This Lion Man is the oldest known piece of art. The artist who made it might not have been able to tell you why he or she gave it that stance, that expression, those adorable little ears. Do you like this guy? Would you like him in your living room? You could probably answer that question pretty instantly. That’s because artists talk directly to System One. It’s hard to explain why we like things – just as artists often struggle to tell us why they made things. Their System One talks directly to our System One. That’s what art is. Well, now we can. We’ve compiled a database that accesses the System One tastes of thousands of people, as well as other psychological and demographic data. So instead of asking people to rationalise what they like, we can understand what appeals directly to their System One. We asked over 5000 people to send us the things they loved most on the internet. We then used some clever analytics to sort those things into groups. These are the key triggers for the System Two brain. But not all of our monkey brains are alike. We find different things funny. We have very different art on our walls and different songs on our playlists. Some seek inspiration in novels, others in a church. So we subdivided those four groups into eight genres each. ‘Funny’ broke down into things like slapstick, deadpan and parody. ‘Beautiful’ split into genres including extravagant, spontaneous and cute. Now, for the first time, we can start to build a map of the System One tastes of a particular group of consumers. Here’s the likes and dislikes of the average UK BMW driver, according to our database. As you can see, they’re a pretty hedonistic bunch. They love to be thrilled, love sensuality and hate deadpan humour. They also are most interested in straight news and least interested in news analysis, which suggests that their System One rejects authority figures that tell them what to think. The size of the quadrants represents the emphasis they place on each group. Now let’s think how BMW appeals to drivers online. It sponsors TED talks, where authoritative people provide analysis – something BMW drivers psychologically reject. BMW’s brand communications certainly inspire in a thrilling way, but focusing all its energy on that one genre passes over much bigger opportunities. BMW drivers have a sense of humour. They love parody. How could BMW appeal to that sense of fun – something the brand has never done? How could it add sensuality to its rather cold and functional aesthetic? Conventional ad strategies begin with rational, system two questions about the brand. What makes our product different? What’s our tone of voice? What’s our message? Once we acknowledge that we’re speaking to an irrational, impulsive decision maker, we need to start from a different place. We need to create a personality that’s appealing to a certain kind of System One. When we go online, our monkey brain quickly takes over… On the morning we get halfway through an article and then we start wondering what our friends are doing on Facebook. We get a quick dopamine hit from some Instagram images and a healthy dose of righteous rage from Twitter… and the article is completely forgotten. How can a brand hope to keep up with those mood swings? By swinging with us. When you understand what your audience wants at any one time, you can communicate in a tone that complements System One. If you know that your audience goes to Twitter for light relief, you can create a parody account. If you know your audience seeks inspiration to get past the Wednesday hump blues, you can provide it – and know the right kind. It takes a shift of advertising thinking to do this. System Two thinking bombards us with a repetitive message. System One thinking is more like an interesting person – multifaceted and unpredictable. Nike. Victoria’s Secret. Comic Relief. All these brands can make you laugh, cry, gasp and take notes. But you don’t have to have a massive budget to be multifaceted. Many of the best multifaceted brands are small ones. Take Rude Health, regularly voted one of Britain’s coolest brands, now distributed in supermarkets all over the country. Rude Health is inspiring – its angry rants against Big Food are everywhere from its cereal boxes to the soap boxes it puts up at festivals all over the UK. It’s also beautiful: it’s constantly reminding us that it’s worth putting a little more effort into our breakfasts – they’ve succeeded in making healthy food hedonistic. Rude Health is Useful, not just for recipes, but for nutrition and lifestyle events. Here they are debating the merits of lard. Rude health appeals to us on a visceral level. Through eight years of downturn, it’s consistently grown by selling small boxes of £5 cereal. There’s no one reason why people buy them – and if you ask them, they struggle to tell you. Rude Health doesn’t have a USP, it doesn’t have a consistent tone of voice. It speaks straight to System One in a multitude of ways, and has built a powerhouse brand on a tiny budget. You can learn a lot about somebody by browsing their playlists, or their Pinterest posts, or the people they follow on Twitter. More, certainly, than they’d ever reveal about themselves if you talked to them. Currently advertisers are interrupting the emotional flow of a journey on the Internet, jolting us out of System One thinking to attempt to tell System Two about some features of a new smartphone. No wonder over 50% of Americans now use ad blockers. Wouldn’t it be much better to go with that flow and tell System One a joke? Wouldn’t it be even better if you knew what would make that person laugh?